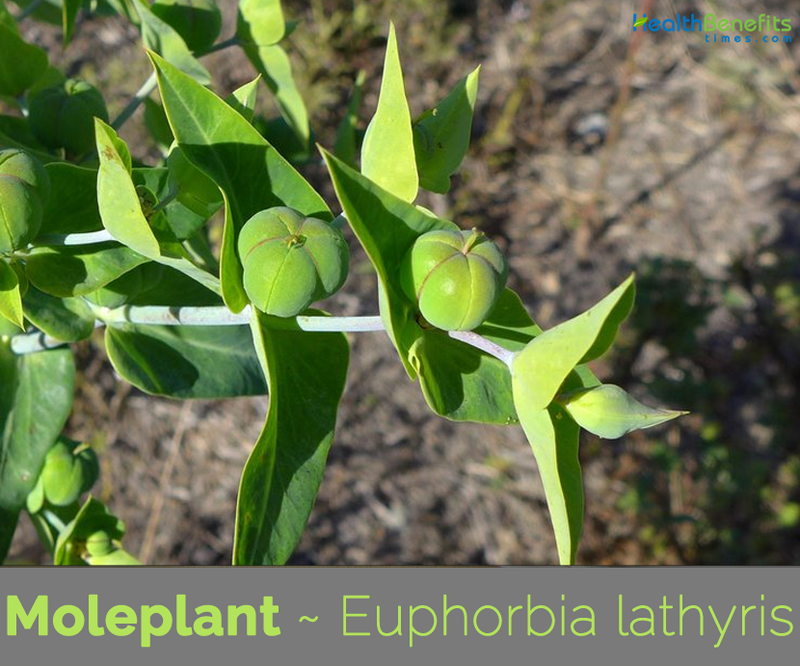 Euphorbia lathyris, the caper spurge or paper spurge, is a member of Euphorbiaceae (Spurge family) native to southern Europe (France, Italy, Greece, northwest Africa, and eastward through southwest Asia to western China. 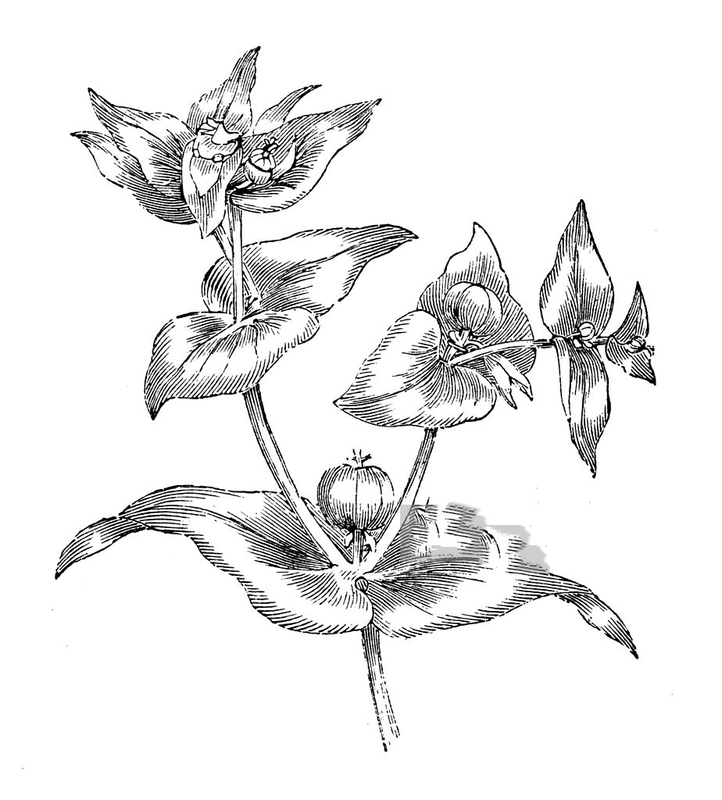 Other names occasionally used include Caper spurge, Gopherplant, Moleplant, Mole plant, Myrtle spurge, Gopher spurge, Paper spurge, Petroleum plant, euphorbia-oil plant, myrtle spurge, spring wort, Wide caper, caper bush, gopher spurge, mole weed, spurge and sassy jack. 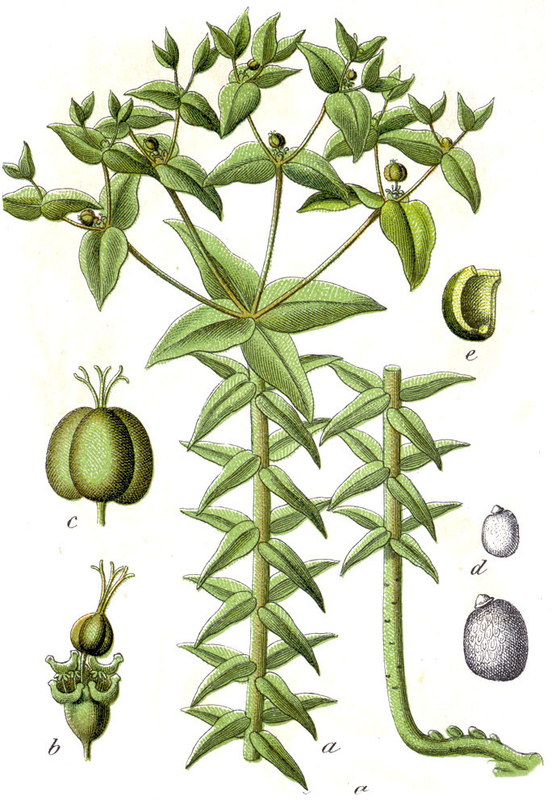 Genus was named after Euphorbes, the personal physician to the Numidian King Juba II, who is said to have discovered the toxic and curative potential of the white and milky sap in the plant. Species name lathyris is an old Greek name for a kind of spurge. Commonly known as the Mole Plant, it is supposed to deter moles which are said not to like the scent exuded by the roots into the soil, or the taste it gives to worms. 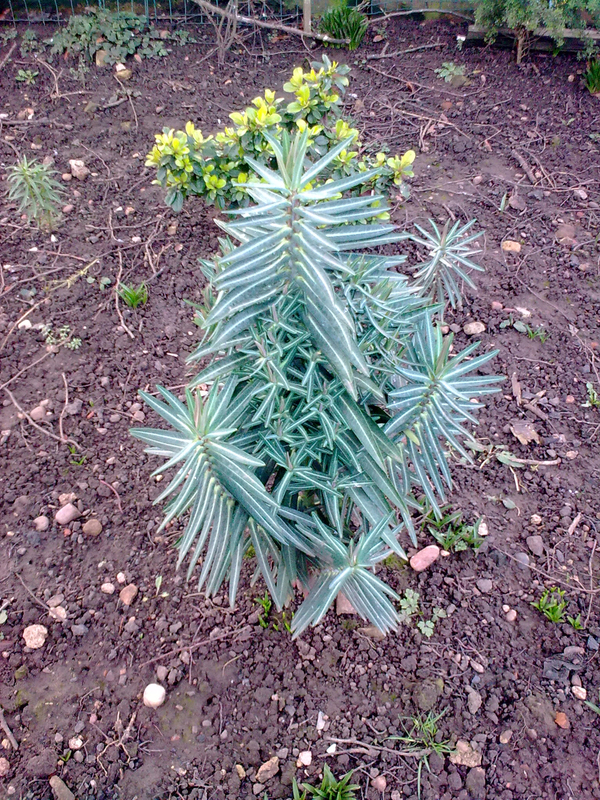 In the US it is known as the Gopher Spurge or Gopher Plant for much the same reason. 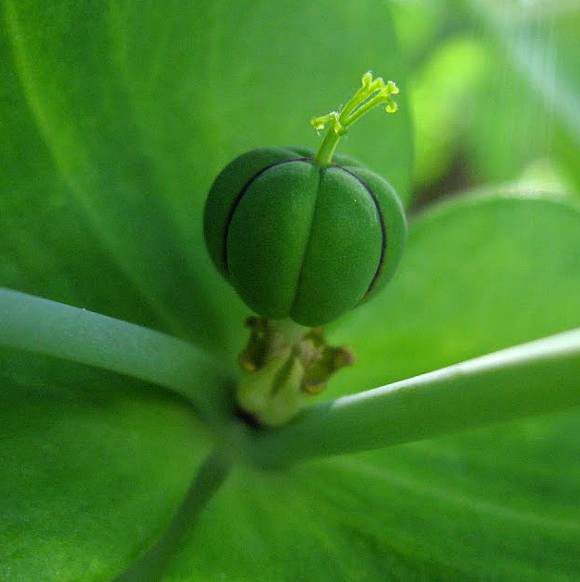 Other common name of Caper Spurge takes its name from the seed pods which look like capers but are very poisonous. All parts of the plant, including the seeds and roots are poisonous. Handling may cause skin irritation as the plant produces latex. While poisonous to humans and most livestock, goats seem to enjoy eating it and are immune to the toxin. However, the toxin can be passed through the goat’s milk. Mole plant is a glabrous to glaucous succulent annual, biennial, perhaps perennial plant that grows about 1.5 m tall with a glaucous blue-green stem. 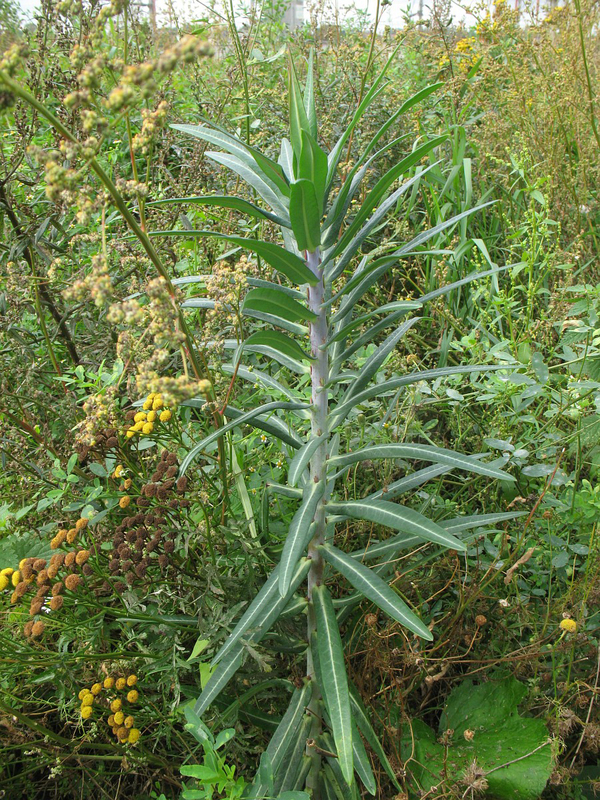 The plant is common and persistent in gardens, waste places, cultivated land, riverbeds, coastal situations, grasslands, marshes, dunes, scrub and chaparral habitats. 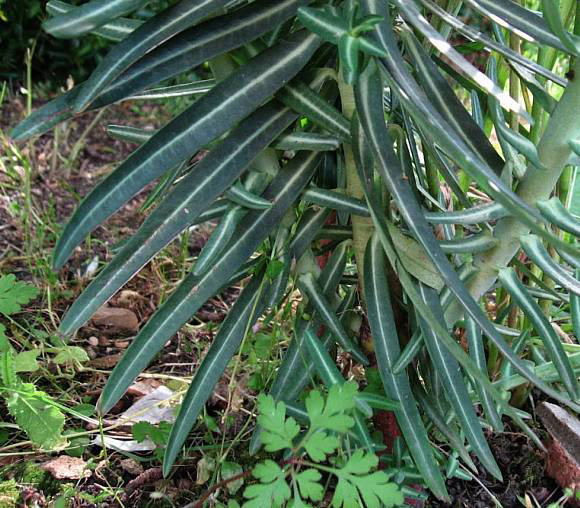 Leaves are lance shaped, arranged in decussate opposite pairs, and are lanceolate, 5–15 cm long and 1-2.5 cm broad, glaucous blue-green with a waxy texture and pale greenish-white midrib and veins. The flowers are green to yellow-green, 4 mm in diameter, with no petals. Flowering normally takes place from May to June. Fertilize flowers are followed by 3-lobed, sub globose capsule which are coarsely wrinkled and 1/2 to 1 cm long. Fruits are initially green ripening to brown or Grey. Seeds are ovoid, flattened, 4–6 mm long, carunculate and hard. Unfortunately, all parts of mole spurge plant are poisonous. 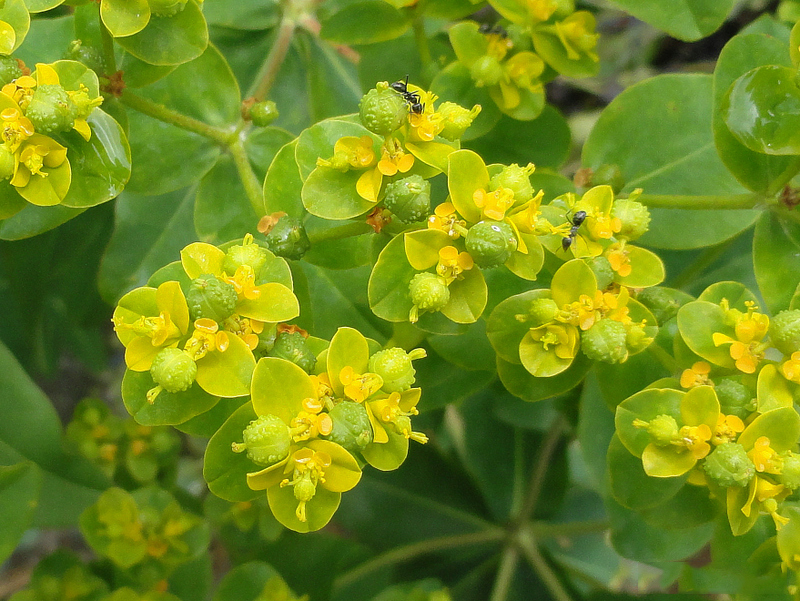 Despite its poisonousness, various parts of the mole spurge plant have been used medicinally through the years. Caper spurge is regarded as an environmental weed in Victoria, Tasmania and the ACT. It has been grown as a garden ornamental and has become naturalized throughout many parts of the world. In Victoria it is listed as an invasive weed of riparian shrub land and riverine escarpment shrub land plant communities. It is also on local environmental weed lists (e.g. the Mount Alexander Shire common invasive garden plants list) and is present in conservation areas in this state. Mole plant seeds, yellow lead and honey can be processed into pills for oral taking to treat difficulty with urination. Powdered Mole plant seeds are taken orally to cause diarrhea and treat edema (swelling caused by fluid retention). Powdered Mole plant seeds mixed with saliva is applied externally to treat snake bites. According to the preliminary research, fresh Mole plant has mild inhibitory effect on Leukemia cells. 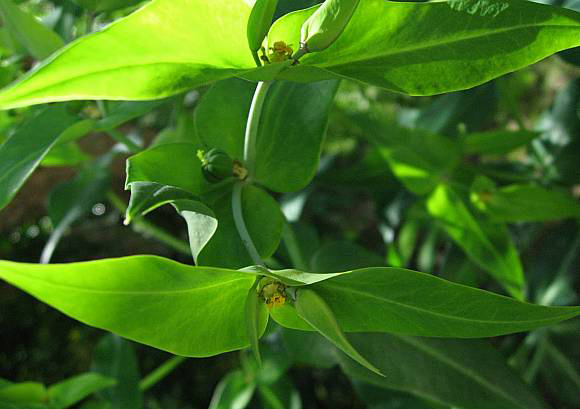 Caper spurge was used in the past as a violent purgative, whilst the rubefacient action of the leaves was used by beggars to raise unsightly sores on their skins to elicit pity and thereby obtain more money. All parts of the plant are emetic and purgative and the plant is nowadays considered to be far too toxic for it to be used medicinally. Latex in the stems has been used externally as a depilatory and to remove corns, but it is too irritant to be used safely. Seed is diuretic, parasiticide and purgative. It has been used in the treatment of dropsy, edema, tumors, amenorrhea, schistosomiasis, scabies and snake bites. Fresh seed has an anti-tumor action, effective against acute lymphocytic and granulocytic leukemia. It is also antiseptic, cathartic, emetic and purgative. One seed capsule is said to cause catharsis, several to cause an abortion. It is used in folk medicine as a remedy for cancer, corns, and warts and has been used by beggars to induce skin boils. Fine clear oil is obtained from the seed. It is a violent poison, producing violent purging and irritation to the intestines. It can be used medicinally when fresh. 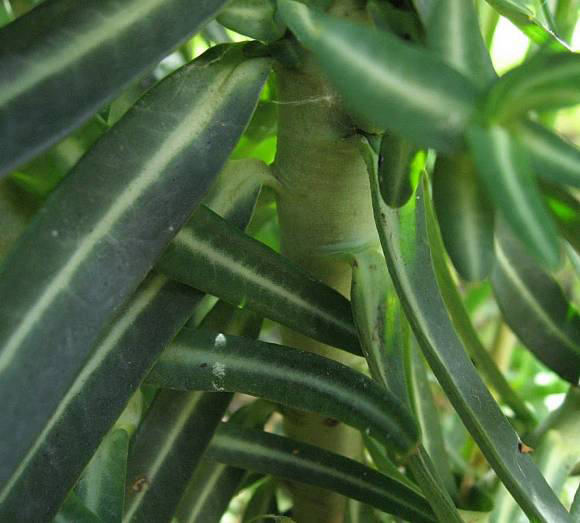 Latex in the leaves can be converted into vehicle fuel. Growing plant is said to repel mice and moles, this is said to be most effective in its second year of growth though lots of reports cast doubt on this ability. Sap consists of latex which is toxic on ingestion and highly irritant externally, causing photosensitive skin reactions and severe inflammation, especially on contact with eyes or open cuts. Prolonged and regular contact with the sap is inadvisable because of its carcinogenic nature. Overdoses result in burning mouth, nausea, diarrhea, dilated pupils and collapse with pallor, rigidity, frigidity, cold sweats, arrhythmic pulse, vertigo, delirium, alternating hot and cold flashes, cramps, etc. Leaf Leaves are arranged in decussate opposite pairs, and are lanceolate, 5–15 cm long and 1-2.5 cm broad, glaucous blue-green with a waxy texture and pale greenish-white midrib and veins. The seed has been used as a substitute for capers. It is very acrid and requires long steeping in salt and water, and afterwards in vinegar.